Once your sanrio collection grows, you'll start to think about trying to maintaining the new condition of a specific product. There are two ways to protect your sanrio collection. You can bubble wrap each item or just avoid having your collection in open dusty air or under direct sunlight. For stickers, what do you do with them? Do you keep them in a small clear bin or just in a drawer of your desk? Or are you one of many collectors, who use the stickers to add to your sticker album? Personally, I do both. I use my double copies of my stickers and put them individually in my sanrio sticker albums. I keep the unopened, but still sealed stickers in a small bin, waiting for me to give it love and tender care when I add them to my sticker photo albums. In order to do this, I have to have specific sized materials made specifically for protection. For small plushes or figurines, have you ever thought of keeping them in clear display cases like trophies? Right now, I have them in my bins, but I do plan to have it displayed one day. I plan to select my most prized plush and stick it in a clear enclosed display case. I wish there was a category for SANRIO in this online shopping website. If only they could listen to my suggestion of catering to the sanrio crowd of collectors. Wouldn't it be fabulous to find clear sleeve protectors for the exact fitted size for many of our different sized stickers? 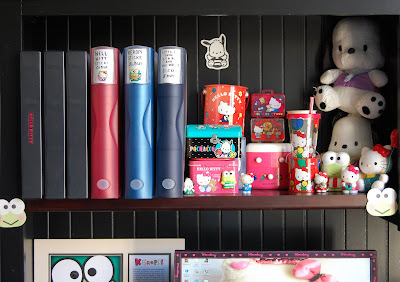 Or specific display cases to show off our sanrio stamp suitcases all together in one big showcase? ^ I keep my mini sticker books in those black cases that you see in the picture above. It is fully enclosed and has a locking clasp mechanism. It's not exactly full proof from open air, but it's better than nothing. Also, it keeps my paranoia that "air contaminates paper" in check. Here's where I get obsessed: Air --> paper --> paper can age --> stickers are made from paper --> PANIC --> Finds an online store to cater to my obsession --> I'm simply going to buy this enclosed 3-Ring Binder case from BU to keep from stressing out. Tip: I have found the PERFECT size protection 3 Binder clear pages for our sanrio mini sticker books!!! Product A12PP. If you noticed on my desk shelf, I have three beautiful different colored folders. These folders are turned into my private sanrio sticker collection albums. For this sticker collection album, I buy backings for each page. One day, I'll probably take a picture, but for now, I love opening them up to see what I have collected so far. If I had the money to spend, I'd buy these labels for my store. But then again, all I need is a printer and I can make my own labels. LOL. Also, here's a nifty idea. Instead of bubble wrap, why not shrink wrap your plushie? *evil heckle* I can see myself doing just that with one of my plushes and it turning out to look like it got suffocated... thinking like it's a real living object. In my obsessed state, I probably would feel guilty. With bubble wrap, there is no guilt because it's not an obvious clear plastic wrap. Am I the only obsessed collector who thinks this way??? Unfortunately, Bags Unlimited caters to baseball, trading card, and coin collectors. Another online store is The Container Store. They have excellent choices of cube cases & displays in different sizes. As you can see there is no such online material-protection store that will specifically cater to us obsessed sanrio addicts... they probably think we're nuts for asking such a thing. But, as collectors, we have to make do what we can and share our resources.